So you’re doing your best attempt at a ‘blogger’ pose, trying to not look too awkward, then you realise you’ve got a few stray eyebrow hairs. Not a great look! Nothing a little sweep with your finger can’t fix though! It’s always scary when you see somebody walking towards you and you’re standing there, mid-pose, trying to get a good shot. What must they be thinking right now?! Do they think we’re being vain?? We’re not sure about you but we get SO many strange looks as soon as we get the camera out. Every single time!! Have they never seen a camera before? We often result in using the excuse “oh you know, just doing this for my photography degree project” in hope that they won’t think we’re as weird. I guess we’re kind of not lying since Rachel is actually studying photography?! This one’s kind of self-explanatory. We’re not models so we don’t have a clue what we’re doing when it comes to being in front of the camera! We’re huge fans of alternative fashion, although we don’t really fit the niche! 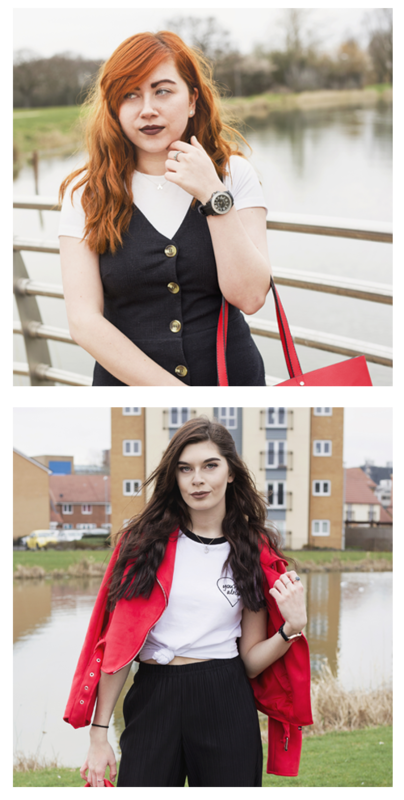 When it comes to getting fashion photos we try our best to look ‘cool and edgy’, although 9 times out of 10, we’re pretty sure it doesn’t go as planned! Sometimes it isn’t until you look back at the pictures that you realise how awkward you look and the weird faces you were making… Or even worse, when the wind blows and your hair decides to go in 10 different directions! We’re pretty sure we all have a blogger or an icon that we look up to in terms of their photos or content. For us, Helen Anderson is always somebody whose fashion photos and videos we admire. That gal could make a paper bag look good!! Sometimes we find ourselves saying “what would Helen Anderson do???”. As we’ve already said, we’re forever using the whole ‘photography student’ thing as an excuse. “These photos will be SO good for my photography project!”. Do any of these thoughts go through your head? We used to always worry about going out for blog photos but we eventually gave in! We’ve done it so much now that isn’t doesn’t faze us as much, we just shrug it off and try not to care what people think! We guess what we’re trying to say is don’t let thoughts like this bother you. We went from being too nervous to go outside for photos to always wanting to go out and shoot!